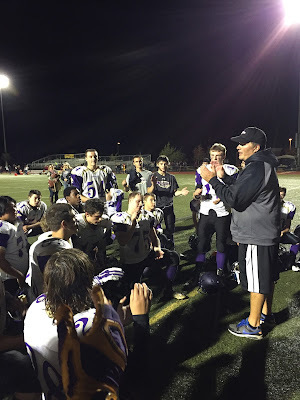 (Kingston) -- Sequim's defense forced 3 fourth quarter turnovers as the Wolves held on to beat the Kingston Buccaneers 13-10 Friday night. 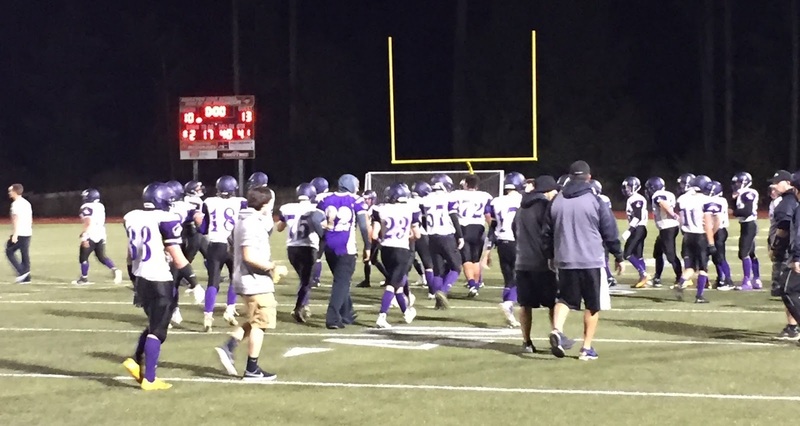 The last defensive gem came when Kane Stoddard intercepted Bucs QB Max English at the goal line on a final Hail Mary from the Sequim 40-yard line as time expired. Sequim (3-0, 1-0 in 2A Olympic League play) led 13-3 at intermission, but the Buccaneers seized momentum after an 8-play, 58-yard drive to begin the second half, culminating with a 1-yard touchdown run by Ali Chiquiti. The extra point closed the gap to 13-10, ending the evening's scoring with 20:57 left in a defensive donnybrook. 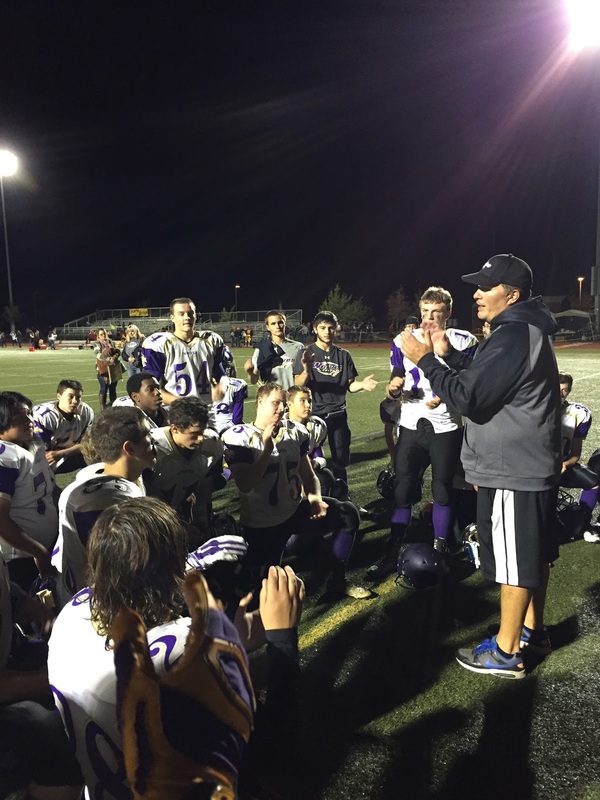 Kingston (0-3, 0-1 in 2A Olympic League play) held Sequim to just 12 net yards on 19 plays in the second half, after giving up 13 points and 160 yards in the first 24 minutes. The difference in the game was Sequim's bend-but-don't break defense, allowing 150 second-half yards and a touchdown, but forcing 3 drive-killing Kingston miscues (a fumble and 2 interceptions). In the fourth quarter, Kingston had a long drive of nearly 6 minutes from its own 1 before Noah Christiansen made his second interception of the game against English, giving the Wolves possession at their own 18 with 5:58 left. 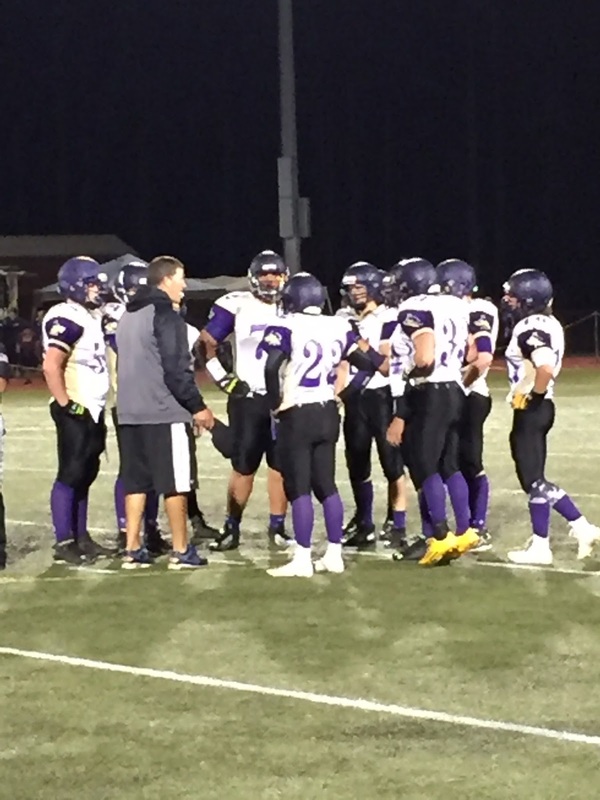 Sequim managed a first down and moved out to the 29 before Nick Faunce punted 37 yards with no Kingston return. On the first play of the drive, Sequim junior James Thayer made a thundering hit on Bucs running back Alex Barrett, jarring the ball loose with the Wolves recovering at the Kingston 34 with 2:47 to go. Sequim was able to run 1:23 off the clock before turning the ball over on downs at the Kingston 33 with 1:24 remaining. Kingston went into hurry up mode, converting a 4th-and-5 from the Sequim 47 on a 14-yard pass from English to Brett Heaps with just 10 seconds left. On first down, English scrambled right and was knocked out of bounds by Brandon Stamper with 4 seconds left back at the Bucs 40. On the final Hail Mary attempt, English lofted the ball high and deep to the center of the field, but Stoddard rose up out of a pack of players to make the game-ending pick. After the opening kickoff, Sequim drove 12 plays to the Kingston 34 before turning the ball over on downs on a 3 yard Gavin Velarde gain on a 4th and 5. 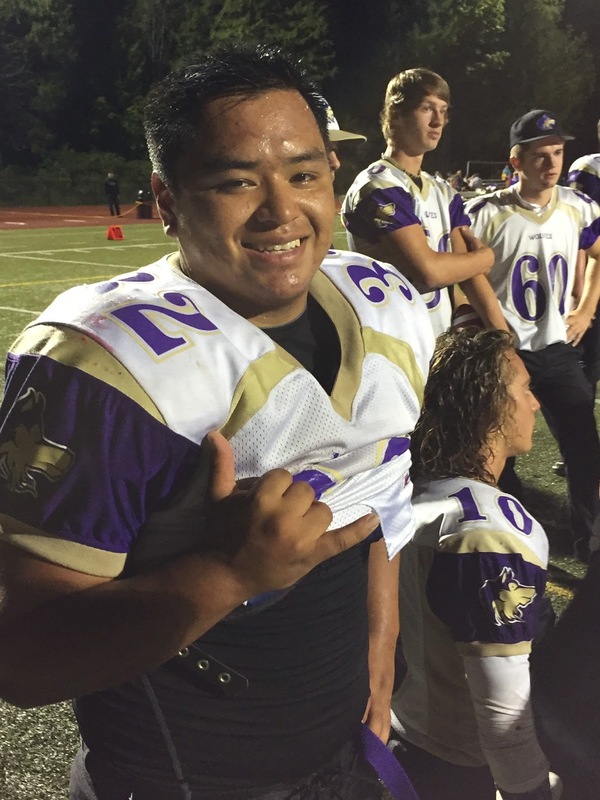 Senior Arnold Black was the first drive workhorse, steamrolling defenders 7 times for 35 yards. He finished with 77 yards on 19 carries for game-high rushing honors. Holding Kingston to just 6 yards on the Bucs opening possession, Sequim started from their own 28 and scored the first points. Freshman quarterback Riley Cowan had 2 key completions on 7-play, 72 yard march: a 39 yarder to Noah Christiansen and a 13 yard grab by Ian Dennis. Christiansen caught the Cowan scoring toss in the left corner of the end zone on 3rd-and-1 from the Kingston 7. Thomas Winfield's extra point kick made it 7-0 with 3:31 left in the opening frame. Cowan was 8-for-15 for 81 yards, a TD and an interception. 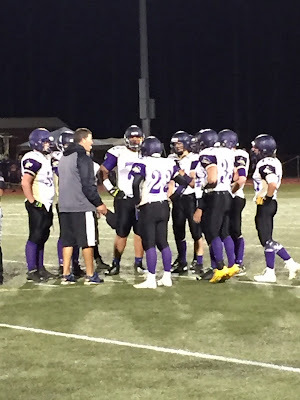 Nearly midway through the second quarter, Kingston reached the Sequim 10 before penalties stalled the drive and the Buccaneers settled for a 31-yard Field Goal by Alex Barrett with 7:31 to go before halftime, Kingston trailing 7-3. Gavin Velarde had a 54-yard kickoff return setting the Wolves up at the Kingston 31. But Sequim lost a scoring opportunity after a Kingston defender wrestled the ball away from Velarde on a long Cowan pass at the Kingston 5 with 4:38 left in the half. The Bucs ran just 2 plays before Noah Christiansen broke in front a receiver, intercepting QB Max English at the 21 and was knocked out-of-bounds at the Kingston 1. English was 15-for-27 in the passing department for 163 yards. He was intercepted 3 times, 2 in the final stanza. Brandon Stamper took the power play the final yard for the score and Sequim was ahead 13-3 after a blocked PAT with 3:15 remaining before halftime. 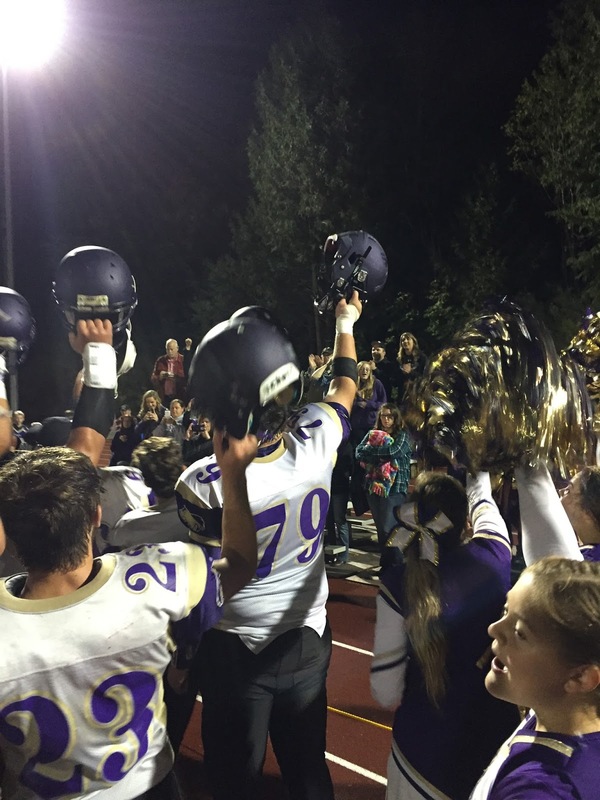 Next week, Sequim will host the North Kitsap Vikings Friday, while Kingston will travel to Belfair to play the North Mason Bulldogs. Sequim - Riley Cowan 8-15, 81 yds, 1 TD, 1 INT, Nick Faunce 1-2, 4 yds. Kingston - Max English 15-27, 163 yds, 3 INTs. 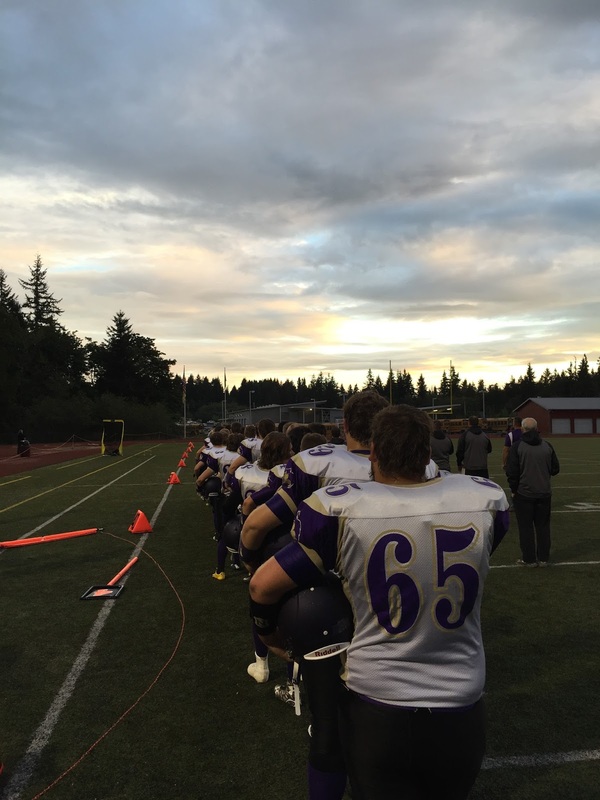 Sequim - Noah Christiansen 3-47-1 TD, Gavin Velarde 2-14, Ian Dennis 2-13, Nick Faunce 1-4, Brandon Stamper 1-3. Kingston - Alex Barrett 3-16, Adam Wright 2-24, Tanner Draper 2-16, Paul Johnson 1-12, Ali Chiquiti 2-14, Brett Heaps 5-81. Sequim - Arnold Black 19-77, Gavin Velarde 7-11, Riley Cowan 4-(-16), Brandon Stamper 5-26-1TD, Nick Faunce 1-(-11). Kingston - Alex Barrett 13-53, Josh Stackhouse 1-14, Ali Chiquiti 6-28-1TD, Max English 8-11, John Jones 1-(-2), Paul Johnson 1-2. Sequim 9-17, 85 yds, 1 TD, 1 INT. Kingston 15-27, 163 yds, 3 INTs.